The North Korean economy by all accounts is actually quite healthy (despite the sanctions and need to spend heavily on defence). South Korea's central bank stated recently that the DPRK economy grew by 3.9% in 2016 over the previous year, which is 7.8 times the rate of growth of the population which is going along at 0.5%. In other words, the availability of goods/services is growing much faster than the population. They keep bringing up the famine that happened nearly two decades ago. Yes, between 1993 and 2000 there were up to 600,000 excess deaths above the normal rate driven by malnutrition and diseases associated with weakened immune systems. It was bad, but the reason it was so bad was because of geography and climate ultimately. Around 80% of North Korea is mountainous and/or unsuitable for agriculture meaning that they always relied on fertiliser inputs, a major cheap supply of which dried up when the Soviet Union collapsed. Unfortunately, the historic 'rice bowl' of Korea was in the south not the north. 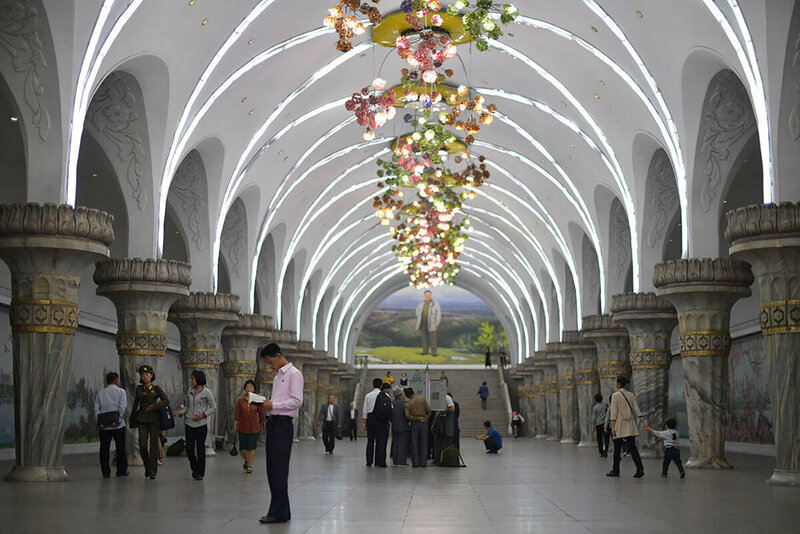 Today we see photos coming out of North Korea that show people enjoying themselves at theme parks and other publicly owned leisure and sporting facilities, we see almost futuristic looking buildings, we see brand new infrastructure like hospitals, and we see extremely clean streets filled with a well dressed and energetic population. Instead of being cynical about all this, how about beginning with the understanding that by 1953 Pyongyang had been reduced to literally two buildings and that the north was completely leveled. Despite this initial setback that western experts love to forget, North Korea still managed to outperform their southern counterparts for most of the cold war, even though South Korea had the advantage of receiving a lot of American investment. Who were North Korea's primary economic partners by comparison? The USSR and China, two countries that lost around 45 million people fighting the fascist Axis in the second world war, and were themselves experiencing the harsh realities of post-war reconstruction. 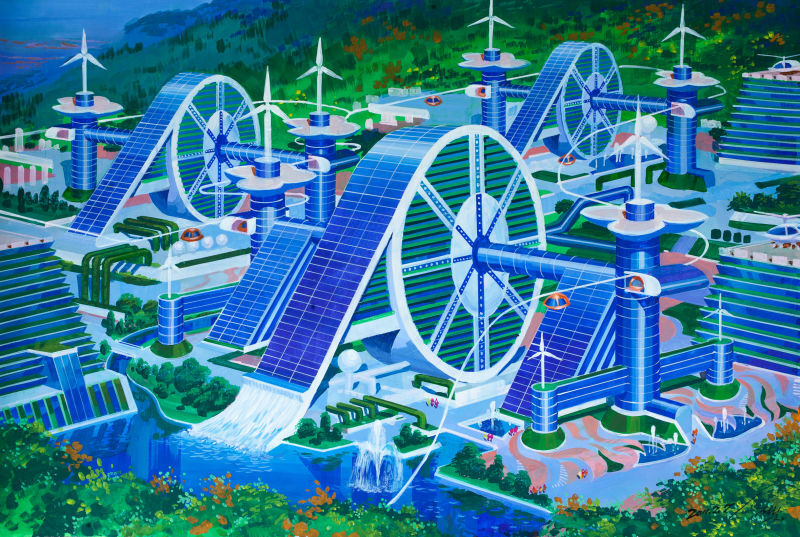 This is how North Korean architects are currently designing their future cities. Click here. The idea that North Korea is a 'dictatorship' shouldn't mean much if you believe that 'substance' trumps 'form'. The extent to which popular anger can be mobilised to compel the government to remove if not punish top officials is a good gauge of how well democracy functions. In March 2010 North Korea executed its Finance minister after what the NYT called "unusual outbursts of protest in the totalitarian state" against the minister's demonetization policies that were intended to "severely punish people involved in black market trading". It was handled poorly to say the least and millions of North Koreans lost their savings, but the important thing to note here is that popular rage got a top official executed. How often do you see that in western countries where top officials have gotten away with far worse instances of corruption? Take the famous case of Kim Jong-un's aunty's husband (uncle) Jang Song-thaek who was executed in December 2013. The media kept going on about how he was executed by being fed to dogs, wrong, he got a simple bullet, nothing more. The real story was that Jang was executed for privately pocketing hard-currency profits from coal and fishing exports, which are supposed to be socialised earnings of course. When Kim sent in the army to retake the coastal areas that Jang had assumed under his private command, his personal loyalists resisted, killing government soldiers who had been sent there by Kim. The private encroachment on what was originally state owned public capital essentially describes the long history of successful privatisations in capitalist countries across the world, but in North Korea, there are powerful class forces preventing such a path from unfolding. Why did the north find land-reforms so easy to conduct? Because of the partitioning of Korea, virtually all the landlords fled to the south in the 50s with all their money because they rationally feared expropriation by the Communists (a view drawn from the book 'Socialist Korea' by Ellen Brun and Jacques Hersh, 1976). The nature of the Korean war therefore was such that classes took the form of nation states, leaving the north brimming with people enthusiastic for socialism, while the capitalists, the traitors who collaborated with the Japanese occupation, the landlords, and the petit-bourgeois reactionaries all traveled to the south where literally the entire southern communist segment of the political population was exterminated in one of the largest mass killings in history. See the Bodo League massacre, this was a crime made possible by American patronage in all its anti-communist fury. These conditions explain why the path taken by state policy appears to have almost obscene displays of uniform mass support (the traditional class enemies are in another state). At this point westerners automatically assume that this is because North Koreans are all cowering in fear of their governments, without ever thinking that a country that gears its entire economy around putting the military first in order to credibly stand up to the most powerful state on earth that once bombed them 'back to the stone age', cannot also be one where the population are timid, beaten and demoralised. No, this is an actively engaged population that has ways of applying pressure from below and getting results. Yes of course there are problems with North Korea, for example, if you watch even the very mainstream documentaries about North Korea you'll know that the obvious economic divide in North Korea is largely between urban and rural populations, with the urban population being wealthier. This may be true but the so-called "elite" are not like the parasitic and worthless elite of capitalist societies, rather they consist of school teachers, scientists and engineers, people whose ingenuity plays a role in providing the indigenous brain power for the state's unwavering drive towards economic self-sufficiency. Are these people paid more? Yes, but this inequality pales in comparison to the obscene inequality you see in the capitalist world for which there is no meritocratic justification at all. The amount of nonsense that citizens of Anglo settler regimes in particular believe about North Korea is astounding. The paranoid media are already publishing articles about how to prepare for nuclear war (hide under a table, yes, that will work). 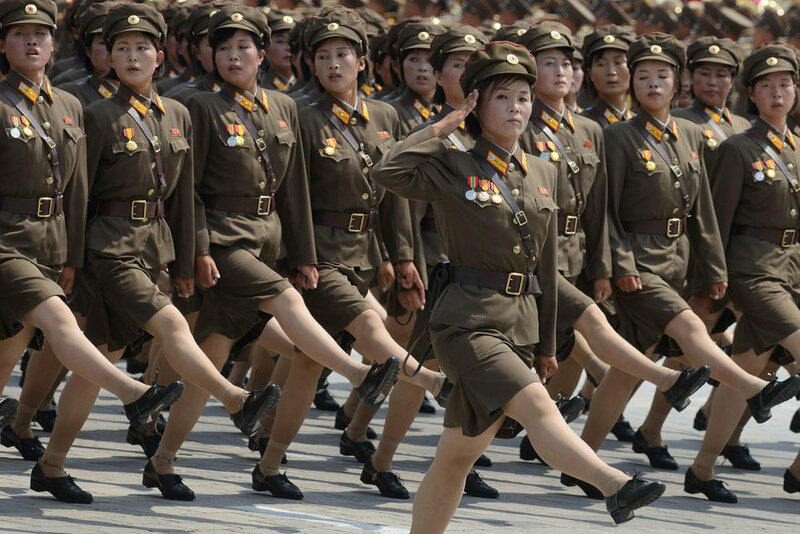 No, the North Koreans are not crazy, their objectives are fairly well understood. They are Korean nationalists. Never in their historical memory has there been a line dividing their homeland into a north and south. That line was drawn by the US military after Japan's defeat following the second world war. From 1910 to 1945 Korea was a colony of Japan, and just as Britain extracted food-grain from Ireland causing major famines, the Japanese imperialists did the same to Korea, reducing the people to poverty. This lead to the formation of an indigenous national resistance movement, dominated by the Communist Party of Korea, the successor to which is the Workers' Party of Korea, which rules North Korea today. Instead of leaving the Koreans to sort the post-war order out for themselves, the United States occupied southern Korea, set up a puppet regime comprised of Korean traitors who had collaborated with the Japanese, who in turn unleashed a genocidal campaign of terror against southern communists five years later. Hundreds of thousands (conservative estimate) were rounded up and shot while the Americans watched. Something very similar happened in Greece after the second world war where the British installed Nazi collaborators who unleashed a campaign of terror against the Greek communist resistance (leading to the civil war) that had bravely resisted the German occupation - these patriots soon found themselves in concentration camps on Greek islands being tortured and killed while the British watched. Unlike Greece where the Left were defeated (forcing many of them to seek refuge in newly liberated socialist Europe) the Korean communist resistance held their ground in one of the cruelest and bloodiest wars of American aggression in the history of American aggression, one which left the north in smoldering ruins. This is what their own military personnel have to say about what they did in Korea. Nearly seven decades later the North Koreans are pretty clear about what they want. They want an end to military drills close to their borders in which the US military practices invasions of their country, they want the US to withdraw the 30,000 troops stationed in the south, and they want the American anti-ballistic missiles removed as well. South Korea doesn't need to be "defended" against North Korea. They belong to the same civilisation, speak the same language, and are in essence the same people. The fact that the North Koreans have developed an ICBM capable of hitting Guam is itself an expression of their desire to avoid harming their fellow Koreans in the south who are being told that they need to paint more targets on their backs for their own safety.